Snuggled in the laps of the Trans-Himalayan belt of Himachal Pradesh, the spell-binding and majestic valleys of Tabo, is a heady concoction of austere panoramas of barren mountains, unexpected bursts of green fields, the untamed and fierce Spiti river and silver white cold deserts. The dramatic valley setting and rustic surroundings blissfully rest against the backdrop of the untouched village of Tabo in the Spiti circuit. Tabo is perched at an average elevation of 12,500 ft above sea level. Tabo, the Himachali village, is a world within a world in itself with breathtaking glimpses of the rugged wild panoramas. The valley's moon-like landscape is dotted with serene surroundings, Tibetan prayer stones and wandering, peaceful-looking yaks. 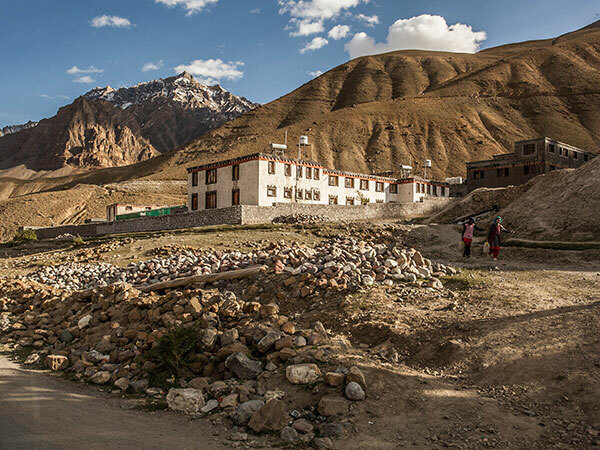 Given the proximity of the village to Tibet, Tabo enjoys its fair share of Buddhist influence as well. The place is an amazing heritage of centuries-old monasteries and several important gompas that are a favourite with the Dalai Lama himself. With its various historical places and serene surroundings, Tabo is a place you should head to for your next Himalayan vacation. By Air: The nearest airbase to Tabo is the Kullu airport which is located at a distance of 294 km from the village. Frequent cab services are available from the airport. By Rail: The nearest railhead is the Kalka railway station which is near about 452 km from the village. Trains are frequent from this station and it is connected with many major cities of the country. By Road: Tabo is connected via roadways to all the major cities of the country. There are regular buses from the Tabo bus stop to all the major cities of the country. Although Tabo is a year-round destination, the best time to visit the place is between the months of March to June as the weather is pleasant with temperature ranging from 25°C to 30°C. The mesmerizing Tabo monastery, or as the locals call it the Chos-Khor Gompa, was founded back in the year of 996 A.D. The beauty of the monastery is unadulterated and untouched by the trials and tribulations of humanity. Preserving the centuries-old glorious heritage of Buddhism, and its traditions and culture, the monastery stands as a specimen of exemplary architectural brilliance. Quoted as the ‘Ajanta of the Himalayas', the monastery is home to some exquisite murals and stucco sculptures, boasting of its spiritual richness. Standing tall and gloriously amidst the cold and rugged valleys of Tabo, this ancient monastery is definitely a place you must visit. Being the architectural marvel the Tabo monastery is, it is enveloped by caves and several cliff-like structures. These cliff-like structures are locally known as chortens and are used by monks for meditation. There are a total of 23 cave shrines in the region, which the monks and the nuns use for several purposes. The cave shrines are primarily used for meditation and have different names on the basis of their usage. These cave shrines are not just of immense historical significance but are also protected by the Archaeological Survey of India (ASI). The Tabo Gompa is an architectural masterpiece and is also reckoned to be the oldest Buddhist monastery in the country. The interiors of the monastery are flanked by a remarkable array of near life-sized clay sculptures of the 28 bodhisattvas along with murals depicting the 10th-century life. At the centre of the hall stands a four-bodied Vairochana Buddha turning the wheel of law, almost as if the entire room being a 3D representation of the Vajradhatu mandala with Vairochana at its centre. The sanctum sanctorum is devoid of any artificial light and the half-dark interiors intensify the mystique of the sanctum. The centuries-old Gompa's highlight is the unlit inner sanctuaries, from where the silhouettes of the stucco of Amitabha Buddha sitting on a lion appears. Amongst the prominent temples of the ancient monastery in Tabo, the Temple of the Enlightened Gods, definitely deserves a mention. The temple also goes by the name of Tug-Lha-khang and is segregated into chambers. It consists of a large assembly hall, a sanctum and a vestibule. At the centre of the hall a four-fold figure of the Vairocana, one of the five spiritual sons of Adibuddha or the primordial Buddha, is to be found. The statue is nearly 2 m long and is seen rotating the Dharma-chakra, the wheel of law. The walls are adorned with life-sized stucco images, paintings and murals depicting the life of the Buddha. Stories have it that artists were brought in from Kashmir to Tabo, so as to work on the paintings.